The final recipe for this month was submitted by Raelynn. There is till time to make this month's great recipes. If you do, come back and let me know what you thought and I will feature you when I post the reviews in about a week. 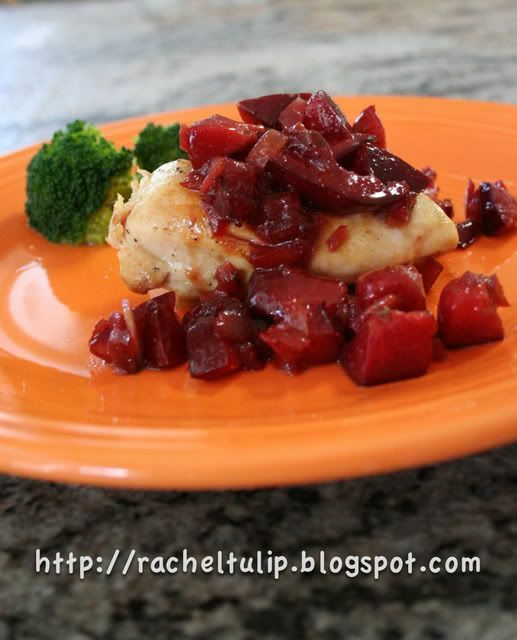 This recipe was one my kids even ate! 1. Season chicken with salt and pepper. In a large skillet, heat 1 tablespoon oil over medium. Add chicken and cook until opaque throughout, about 5 minutes per side. Transfer to a plate. Set aside. 2. Make chutney: To skillet, add remaining 1 tablespoon oil, onion, and jalapeño; cook until softened, about 3 minutes. Increase heat to medium-high; add plums, sugar, vinegar, curry powder, ginger, and 1/4 cup water. Bring to a boil; reduce to a simmer, and cook until plums are softened and liquid is slightly syrupy, about 8 minutes. 3. Add chicken and any juices that have accumulated on plate; simmer until heated through, about 4 minutes. Season with salt and pepper to taste. Serve chicken with chutney spooned on top. What a unique way to prepare chicken! I am always looking for new recipes to mix it up a bit. Thanks! I am impressed they ate it. I don't think mine would. It sounds really good. Boy, does that ever sound good, and look good!